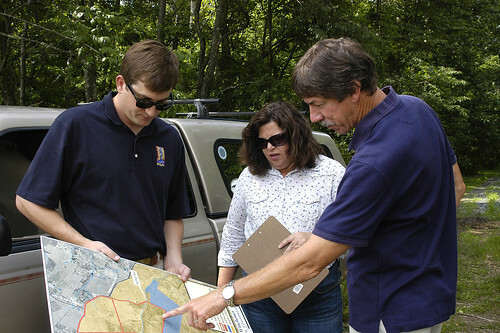 Mike Liskey, right, refers to a site map while discussing ongoing conservation projects with Chase Milner, with the foundation, and Amy Roscher, with the Virginia Farming television program. NRCS photo. Three out of every five Civil War battles were fought in Virginia, so it should come as no surprise that some of the work of USDA’s Natural Resources Conservation Service (NRCS) is taking place on hallowed ground. In Winchester, Va., the agency is partnering with the Shenandoah Valley Battlefields Foundation to protect historic and natural resources on part of the Third Winchester Battlefield. The foundation has discovered that keeping these sites in agricultural use is an economical way to maintain them. They have worked with NRCS since 2009 to preserve and conserve Huntsberry Farm, a 209-acre farm where cattle still graze today. NRCS District Conservationist Mike Liskey helped Chase Milner, the foundation’s manager of stewardship, with conservation planning to address their concerns about water quality and invasive species while protecting vital cultural resources. NRCS, Trout Unlimited, and the Lord Fairfax Soil and Water Conservation District provided funds for a number of conservation practice that will lead to cleaner water on the battlefield lands and beyond. Stream fencing will keep cattle out of Redbud Run, which flows into Opequon Creek, a tributary of the Potomac River and Chesapeake Bay. Cross fences installed for rotational grazing will help eliminate bare spots in pastures and promote more even distribution of manure to reduce runoff into nearby waterways. 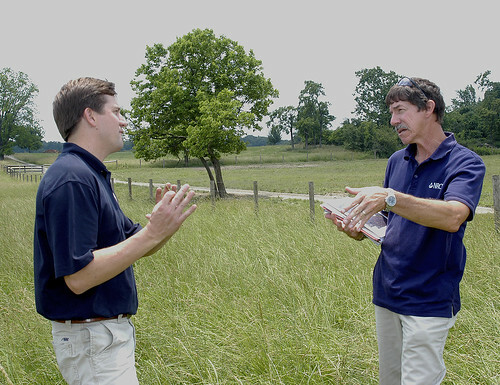 NRCS District Conservationists Mike Liskey talks to Chase Milner with the Shenandoah Valley Battlefields Foundation on optimum grazing and mowing height for grasses in this paddock, which is part of a rotational grazing system installed with NRCS assistance. NRCS photo. The foundation also worked with the Virginia Department of Game and Inland Fisheries and NRCS to remove invasive species and plant native warm season grasses and wildflowers. Much of the conservation work will be completed in time for the 150-year anniversary of the Third Battle of Winchester this September. 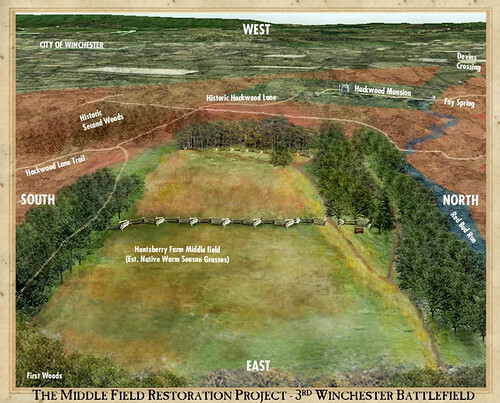 This artist’s rendering shows how the middle field area of Huntsberry Farm will look once it is completely restored. Shenandoah Valley Battlefields Foundation artwork. I've done work on Civil War Battlltfieds in Hanover Cty. I've with Mr. Bob Bluford. He's had me help preserve trees on the sites that were present during the campaigns.If can be of any help please contact me.